When a body bumps against the dock just a few feet from Eva Fairchild’s floating house on the night of her welcome party at the marina, she begins to wonder if her recent move across the country was such a good idea. Combine the resulting murder investigation with mysterious nighttime kayak trips, politicians run amok, nosy neighbors, and culinary lessons for her blue-haired, teenage tagalong, Willow Ratliff, and Eva has her hands full. It doesn’t help that the police detective on the case is handsome, annoying, and more than willing to match her snide remarks with witticisms of his own. Soon, Eva is a walking repository of other people’s secrets. It’s not a role she ever asked for, and it might just prove lethal. 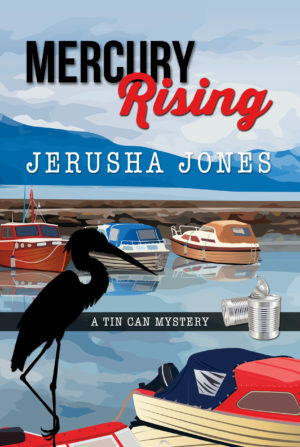 Sign up for my monthly newsletter with information about new installments in the Tin Can series or the Imogene Museum series or the Sockeye County series (or anything else new!). Also tidbits about what I'm currently working on, maybe some sneak peeks, and the occasional freebie. It's possible there will be a cute puppy picture (or two) included as well. Happy reading!